The Earth – home to all known creatures and one of the most versatile planets in our solar system. If we look down on it from space, its surface is mostly blue. Over 70% of our planet is covered with water, which make oceans the largest habitat for life on earth. In fact, we have only explored 1% of the underwater world. But from the Arctic Ocean down to Australia’s Great Barrier Reef, oceans hold an enormous amount and variety of creatures – from the largest animal on earth, the blue whale, to the smallest algae. Even in the most hostile areas, deep down at the bottom of Mariana Trench at a depth of 11,000 meters, there seems to be life. The award winning BBC nature documentary B l u e P l a n e t II (2017) reveals breathtaking stories of the underwater world. 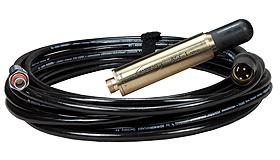 Amongst other new recording techniques, some specially developed for the series, Ambient’s underwater surround system helped them to unlock a not so silent world. Unlike the physics of airborne acoustics, sound waves in water travel 4.5 to 5 times faster than they do in the air. That also leads to an equivalent greater wavelength and allows blue whales to communicate over thousands of kilometers. But the language of marine animals still seems to be a mystery. 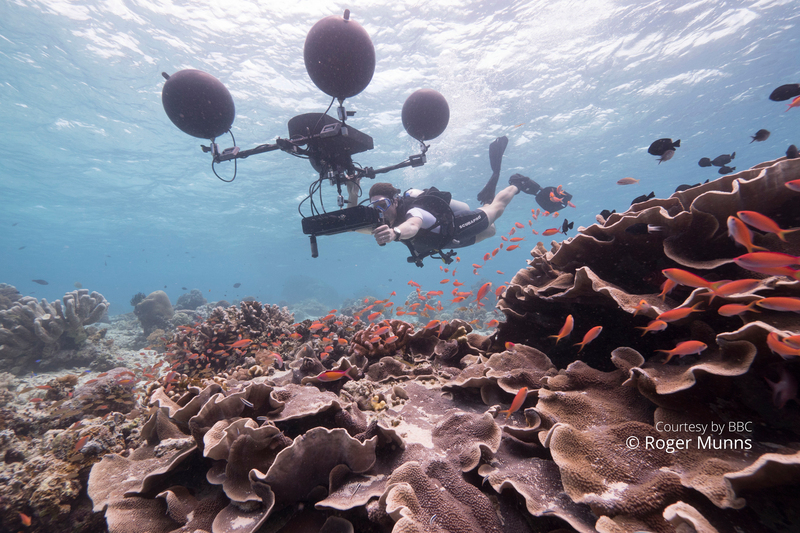 In order to make the series sound more naturally realistic – for example by recording the underwater soundscape of a coral reef – the BBC producers went for the RS5 surround rig, including 4 directivity spheres maintaining low noise ASF-1 hydrophones. 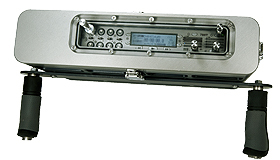 The multichannel array ran into a Sound Devices 788T embedded into a hard-anodized and PTFE coated underwater housing, specially built for the Sound Devices 7 series. Although most people are aware of the well known click detection of dolphins or the vocal sound of a whale, there is still a huge lack of knowledge in public about species using acoustic communication and in particular the importance of it for marine life. For the “coral reef” episode, a small, rather inconspicuous fish attracts the attention of the B l u e P l a n e t II crew: the clownfish. By emitting a buzzing sound, the dominant female will warn off potential attackers and predators from their nest. 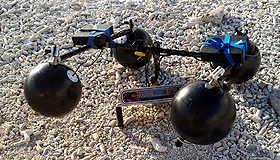 But by recording these underwater sounds, Steve and the crew were not only trying to put focus on biological sound sources. Noisy boats, seismic air guns used for oil exploration, sonar systems… just to short list some of the noise polluters around the sea. The damage to specific ecosystems is immense. The B l u e P l a n e t II crew really pushed the boundaries of what’s technically possible and their spectacular recordings helped us to understand a little more about the most important ecosystem on Earth. Ambient is proud of being involved, and to contribute voices to stories that haven’t been heard before.